What was Calicut like before the Zamorins established thier rule in the 12th century? We have only folklore masquerading as history to rely upon. Keralolpatti and Keralamahatmyam are thinly disguised attempts to portray Brahmin supremacy over the ruling classes founded on the adventures of the ubiquitous Parashurama. Sifting history from folklore is a formidable task. Prof. MGS Narayanan is categorical that ‘There was no city of Calicut (Kalikooth of the Arabs, Kallikkottai of the Tamils and Kozhikkode of the Malayalees) before the 12th century of the Christian era. There was no harbour or trade centre.’ (page 58, Calicut: The City of Truth Revisited, 2006) If we accept this proposition, we have to assume that either Porlathiris, the rulers of these parts before Zamorin annexed Calicut, during their last days or Zamorins themselves after their conquest of Calicut must have developed Calicut as a port and trading centre. When did Calicut develop as a major trading centre, visited by merchants from faraway places? From the above statement, it must have been during the 12th century. But, we find references to Malabar in general and Calicut in particular during the same period suggesting that it must have already been a developed port. For instance, Marco Polo visited Kerala in 1293-94 and refers to Calicut as the ‘Kingdom of Melibar’, second only to the Kingdom of Eli (Ezhimala). ‘There is in this Kingdom a great quantity of pepper and ginger and cinnamon and turbit (the pigeon rearing of Kundungal and Kuttichira must have been quite an ancient hobby!) and nuts of India. They also manufacture very delicate and beautiful buckrams. (Buckram during Polo’s days was not the stiff cloth known today but fine cotton cloth – what was Calico called before Calicut was founded??) The ships that come from the east bring copper as ballast. They also have cloves and spikenard and other fine spices, for which there is a demand here for the products of these countries.’ There is no mention of Zamorin yet. The first such recorded mention is in the travel accounts of the Moroccan traveller, Ibn Batuta (1342-45) who stated unequivocally: ‘The Sultan of Calicut is an idolator known as the Samuri’. Prince north to Calicut and his conquest (by deceit?) of the Porlathiri must have taken place much later, perhaps in the second half of the 13th century. How do we reconcile this with the tradition that before Manichan and Vikkiran inherited the land, the present day Calicut was a marshy patch with possibly some salt pans? And the statement quoted above that there was no Calicut before the 12th century? Although Marco Polo did not refer to the buckram cloth as Calico, it is known that the 11th Century Jain scholar from Gujarat, Hemchandra had referred to Calico in his writings. Could there be Calico without Calicut? If Calicut was unknown before the 12th century, why did all the Arab travellers make a bee-line for this place, if all it had was some salt pans and thorny bushes. How did the 9th Century Persian geographer Ibn Khordadbeh (820-912 AD) who was working as the Director of Posts and Police, know of this place and why did he write about it? What about the Arab traders who had settled here and had fathered children by local women? We are yet to find out answers to these and many more questions. Recently a new window was opened to Malabar’s history during this period by the erudite presentation before a select audience of Calicut Heritage Forum (full report and the presentation may be seen at the CHF site http://calicutheritageforum.googlepages.com/meeting923 ) by Ullattil Manmadhan, known to history buffs as Maddy (http://historicalleys.blogspot.com) . In short, Maddy spoke of the story of a Jewish entrepreneur, Abraham Yiju who had not only set up an industry in the Malabar coast in 1120 AD but had even married a local girl. 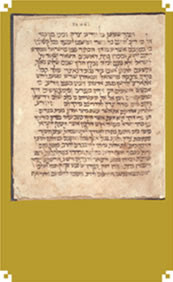 The new findings came from deciphering the Geniza fragments(http://www.genizah.org) are still being studied by historians in Cambridge and Princeton. The industry was utensil manufacture and the market was Egypt and from there to Rome. Calicut and surrounding areas must have been a vibrant manufacturing and trading centre even much earlier than now thought of. The testimony of Marco Polo that copper was being used as ballast in the ships arriving from the east corroborates the fact that metal forging and smithy must have been a major industrial activity in and around Calicut. There is urgent need for the academic community to take the lead opened up by the Geniza documents and research on the antiquity of Calicut and its status as an industrial and trading centre before the 12th Century. It is time we moved on beyond pseudo history like Keralolppaththi! Very good article!!! calicut has always been a wonderland for all travellers, so in the 13th centuary, if the port was somuch developed, then it would have been in business even before 10th centuary because a port cannot be born all of sudden!! i think its time to revamp kerala history from the recent findings!! and i always had doubts with northern ballads, what do u think!! did Aromal & unniarcha lived, and if they lived have any idea about the centuary they lived?? I am surely not a historian or even a student of history.When I read the latest issue of the blog I thought of sharing some information. While pursuing my interest (sacred plants, spices, medicinalplants )I came across references on Medieval Calicut. The history of Calicut is part of the hsitory of the Malabar coast, may not be politically, but in the matter of trade relationships with the rest of the world. The Medieval travellors were more enamoured of Kollom, and then Calicut; Cochin was added much later, I think. Nicolai Conti visited Calicut during 1430 and he described Calicut as "a maritime city , 8 miles in circumferance, a notable emporium for the whole of India abounding in pepper, aloe, ginger, a larger kind of cinnamon, myrobalans and zedoary." He reported the merchant ship building in Calicut and commented "The natives of India build some ships larger than ours, capable of containing 2000 butts and five sails and as many masts. The lower part is constructed with triple planks in order to with stand the forces of the tempest to which they are much exposed. But some ships are so built in compartments that should one part be shattered the other portion shall remain entire and may accomplish the voyage." ( India in the XVth Century, Kaliyut Sopciety Publications, Vol.II, p. 27). This very same source has the following refereence quoted Abder-Razzak who visited calicut in 1442: " One of the greatest shipping centres of the world in this period, from where vessels are continually sailing for Mecca, which are for the most part laden with pepper. The inhabitants of Calicut are adventurous sailors; pirates do not dare to attack the vessels of Calicut. In this harbour one could find anything one desired". Later the Russian traveller Althanaseus Nitiken, who visited India between 1468-1474, wrote " Calicut is a port of the whole Indian sea, which God forbid any craft to cross and whomsoever saw it will not go over it healthy. Ther country produces pepper, ginger, colour plants (turmeric and indigo), muscat, cloves, cinnamon, rootys of every description of spices ". (Why the comment God forbid....Zomorins were not sea pirates, can this mention points to the pirate activities of the Arab Moors who dominated the Arabian sea and spices trade in those times ?). Prof. Das mentioned about a community 'Panis' who were the original inhabitants of the Indus valley and werer expert maritime travellers and ship builders; were persecuted by the Aryans,and as egment of Panis left their home land and reached in due course the malabar coast and that they taught the art of ship building to the Pandyans of the region. This community got integrated with the pandyans through marriages. Part of this community migrated to the Gulf region and established a colony near the mouth of Euphrates......( Das. AC , Rig Vedic India, 1921) Can the malabar people partly decended from the Panis?. Many thanks, Sanjay for your comments. I entirely agree on the need for a revision to our static position regarding the history of Calicut prior to the 13th century. No port can come up overnight without a rich and vibrant hinterland. So if Calicut was a developed port, the hinterland must have been developed as well, much before export takes place. I think we should question the chronology of ballads, even while accepting the social history which they describe. Thank you, Dr.Ravindran for the scholarly summary of the record of travellers to Calicut. Razzak was one of the earliest to mention about the Zamorin. I genuinely feel that the Zamorin historians have eclipsed earlier chroniclers. We have now to reconstruct pre-Zamorin history from internal evidence like the Thiruvannur inscriptions and external sources like the Genizah fragments. It was indeed a good writ out from you sir, especially i am thankful for giving us some insight on the history of medivial calicut by quoting it from the travelogues of Nicolai Conti & Razzak which was a new peace of history for me, i have heard about the Russian traveller Althanaseus Nitiken who wrote, "Calicut is a port of the whole Indian sea",i think the actual notation was "whole of Arabian sea" and not "Indian sea", correct me if i am wrong. That was a good reminder - CKR, of much work that is needed to revise some misunderstandings that we have all picked up over the way from various books. Some questions in continuation to yours..
1. Was Calicut ever a medieval port - Probably not, it was most possibly Pantalayani Kollam. 2. Was Kollam here confused with Kulam - Quilon in history books? Yes & no. 5. These small ports slowly ceased to exist - even though the trade volume when compared to today's standard was minuscule. Hopefully we will have many more interested researchers..
And once again thanks to the Calicut Heritage forum for reminding us that it needs to be done..
Let me add another possible dimension to this 'gap'. I was reading a book on the history of the world through Food ('The Edible History of Humanity' by Tom Standage - a very interesting book I would energetically recommend). And in this book, in the section on the world spice trade, is a reference to the famous Chinese Admiral Zheng He who led a huge armada in the early 1400s to various parts of Asia, including the Malabar coast. I have never come across any significant writing on Chinese visitors to Malabar. Is anybody aware of any account of the Chinese in Calicut? I have just got back from my first visit to China and cannot resist digging for historical connections! Thanks, Hari Nair for adding a culinary dimension to the debate. There are some studies on the Chinese in Calicut, notably by Prof.Haraprasad Ray. Chinese had monopolised the trade in Calicut and Zheng He died in Calicut on his last voyage and was believed to have been buried at sea off the coast of Calicut. He had erected a memorial stone which is now not traceable. They were supposed to have abandoned Calicut after a massacre of the Chinese by the Moplahs (purely trade war, as both were Muslims). On the culinary side, they have left behind the Cheena chatti (wok), the Cheenabharani and Chhena mulaku! Yes, of course. I forgot to mention the brilliant posts by Maddy on the Chinese in Calicut in his http://historicalleys.blogspot.com It is such a mine of information that each sentence can be a full-length book if properly researched! Also forgot to mention Asin Das Gupta, another historian. But all of them have only touched the fringe of the Chinese sojourn in Calicut. An informative post. Learned readers have enriched it further by their comments. Thanks. Many thanks, PNS, for your words of encouragement!